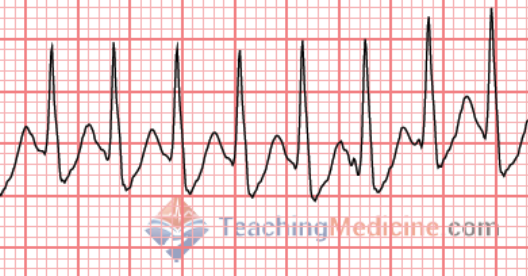 In this lesson, we will learn how to determine the heart rate. If we had one heartbeat with every big square, then there would be 300 beats per minute (bpm). If we had one heartbeat every 2 big squares, then the heart rate would be 150 bpm. If we had one heartbeat every 3 big squares, then the heartrate would be 100 bpm. Starting to see a pattern? Sometimes, the rhythm of the ECG is not regular (there will be faster and slower sections). If that is the case, then do your best to take an AVERAGE value for the heart rate. In truth, sometimes the heart rate is variable and changing from minute to minute and there is no single correct heart rate value. A slightly different way of doing the math is to use small squares instead of big squares. There are 5 small squares in a big square, so the equation becomes (300 x 5) / (small squares) = 1500 / (small squares). One challenge you will encounter is how to calculate the rate when the rate seems to be changing. For example, if the rhythm is not regular, the rate will apear to be always changing. There are 2 ways to deal with this. First, you can measure a few different QRS complexes and average it out. The second method is to use a full page 12 lead ECG. A full page 12 lead ECG will have an ECG tracing for 50 big squares. There are 5 big squares in one second, so a full ECG tracing is 10 second long. If you multiply by 6, then you can calculate the rate in one minute. Now go practice your awesome heart rate skills!